Learning Greek can be a difficult task. It takes years of study and countless hours of practice before you reach the point of reading the Greek New Testament without the help of additional resources. Unless your aim is to be a New Testament scholar, most will not achieve that level of comfort with the Greek text. That doesn’t mean you can’t benefit from using the Greek New Testament in your studies. Whether you’re someone who can read Greek proficiently or have only ever used a Strong’s Bible, Olive Tree’s NASB Greek-English Interlinear New Testament is here to meet your needs. The NASB Greek-English Interlinear New Testament makes it easy to perform in-depth original language word study by putting everything you need at your fingertips. It combines the benefits of the NA28 with Mounce’s parsings and the NASB with Strong’s into a single resource. Quickly view the Greek text and tap on any word to view its parsing and definition. This allows users to quickly look up fuller meanings of words in the Olive Tree Enhanced Strong’s Dictionary, which is bundled with this resource. From the same pop-up quickly search and find everywhere the word appears in the New Testament. Below the Greek text you’ll find a basic English translation and the related Strong’s number. The last line of text in the interlinear is the text of the NASB Bible, which is also linked to the Strong’s data. With the NASB Greek-English Interlinear New Testament you can see at a glance how translators made their translation decisions by comparing the Greek and its glosses to the NASB translation. If you’re a Greek student use it to brush up on your vocabulary and reading without getting bogged down on the words you don’t know. There are numerous uses for this fantastic resource. Olive Tree’s NASB Greek-English Interlinear New Testament text follows the order of the NA28 Greek text, the current scholarly standard, but provides English glosses based on the NASB translation for the same verse. Since the NASB provides a word for word rendering of the text as much as possible, most words in the Greek text will have a corresponding gloss from the NASB. This allows readers to see how the Greek text and the English translation line up on a word by word basis. 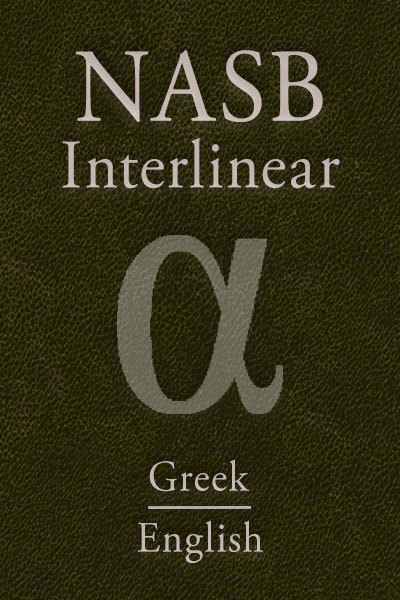 With even a basic knowledge of Greek grammar, the NASB Greek-English Interlinear New Testament will prove you with deeper insights into the Greek words used in the Bible. Upgrade Pricing Available! If you've previously purchased the previously purchased the New American Standard Version, New American Standard Version with Strong's or the NA28 with Mounce Parsings, you can purchase this item for a special upgrade price. The upgrade price will be visible when you log in to your Olive Tree account and add the item to your cart (NOTE: Upgrade pricing is only available on www.olivetree.com, and not via in-app purchase).